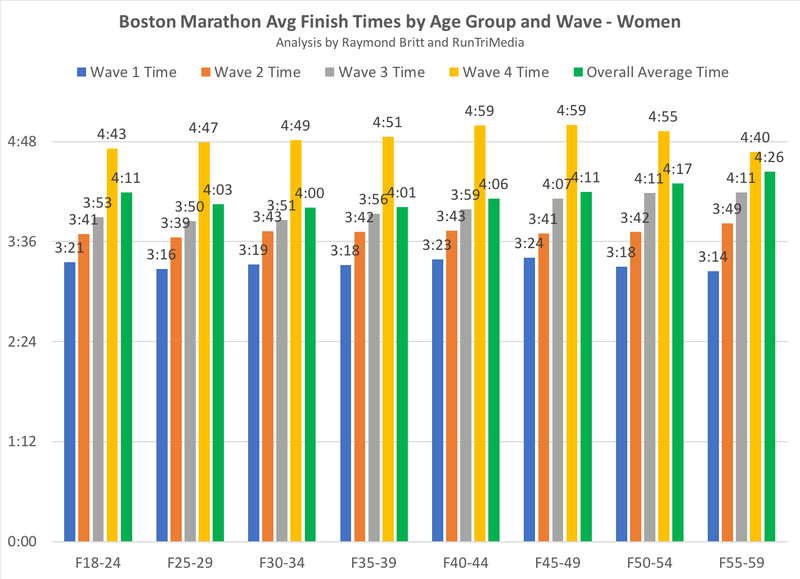 Just about everything you need to know about training for and racing great marathons and Ironman triathlons, from Boston to Kona, and beyond. 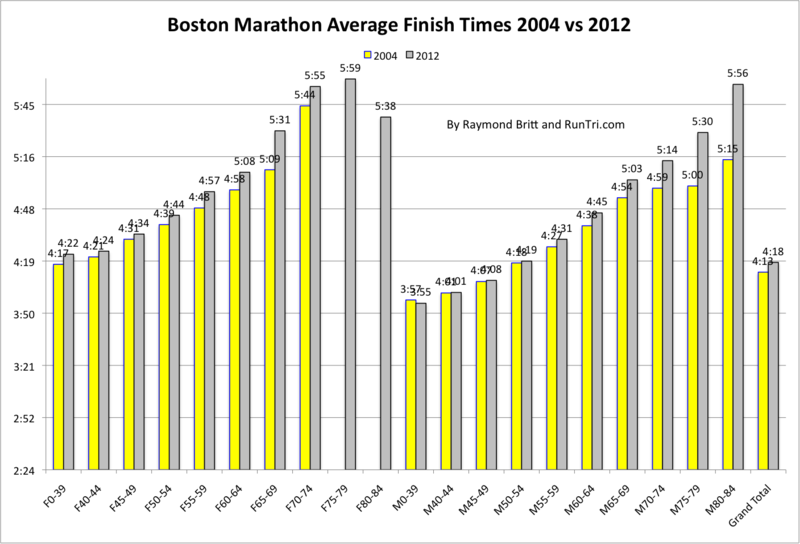 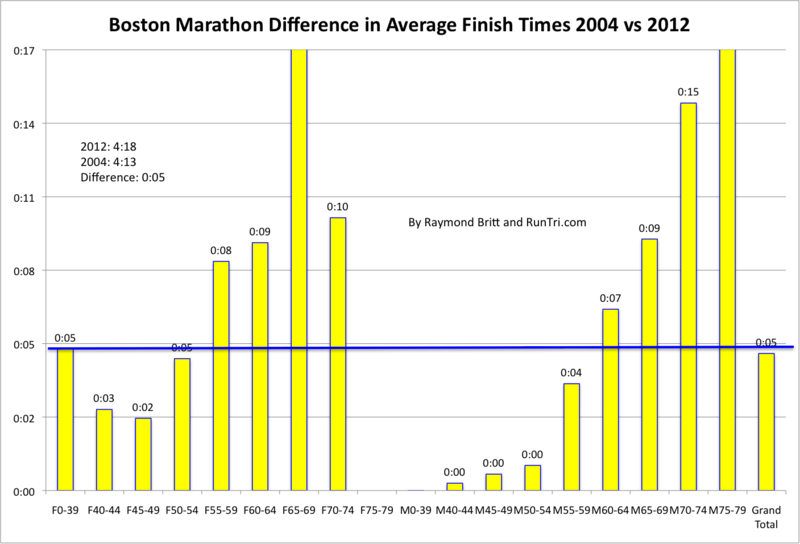 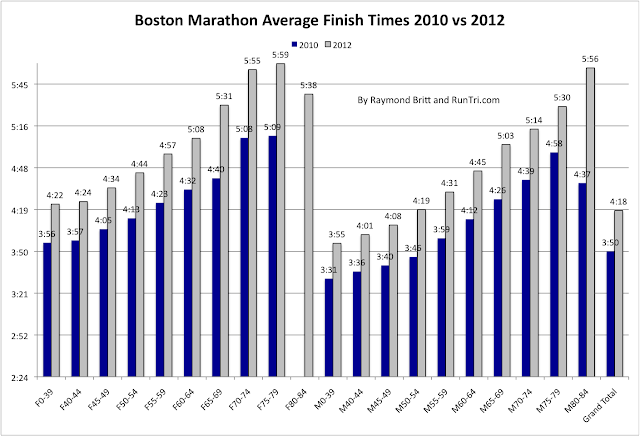 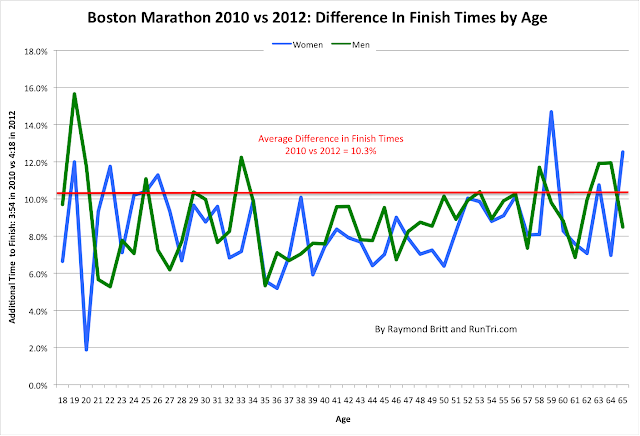 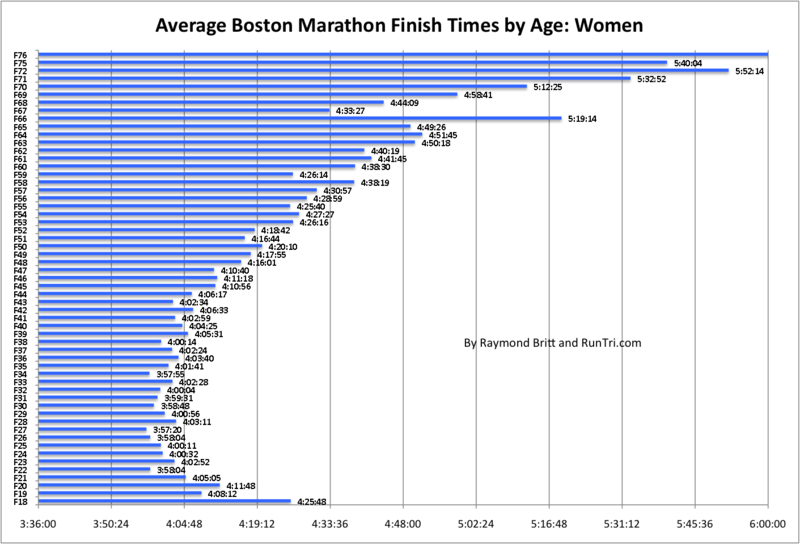 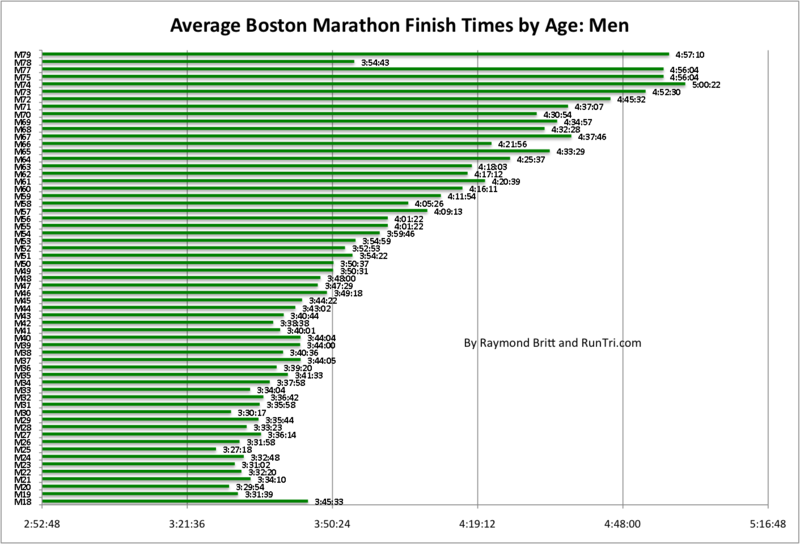 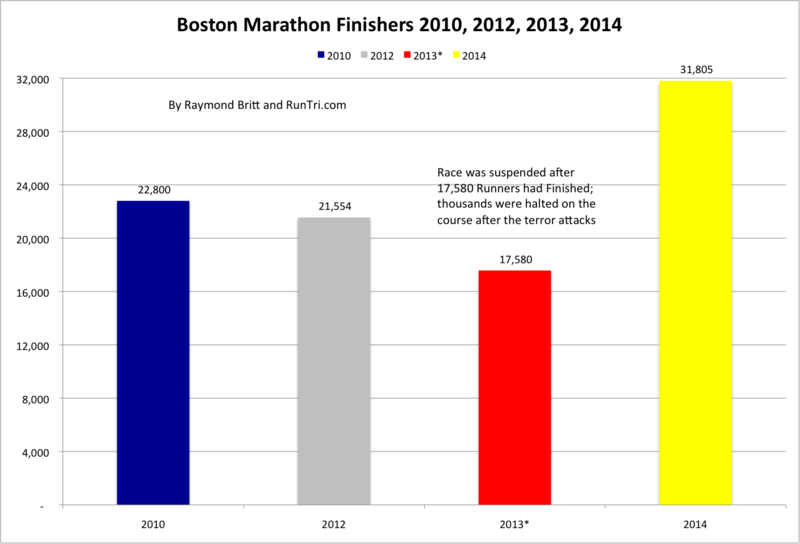 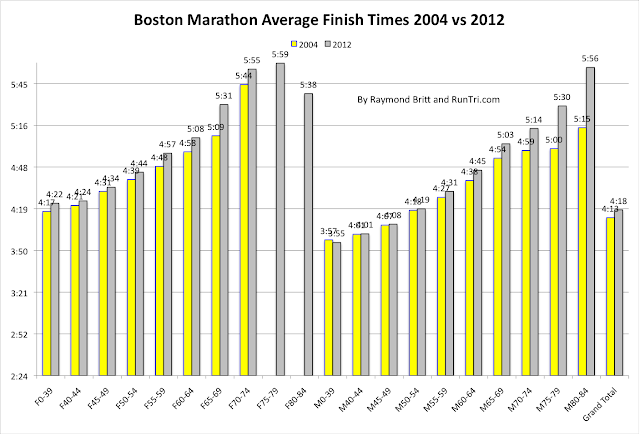 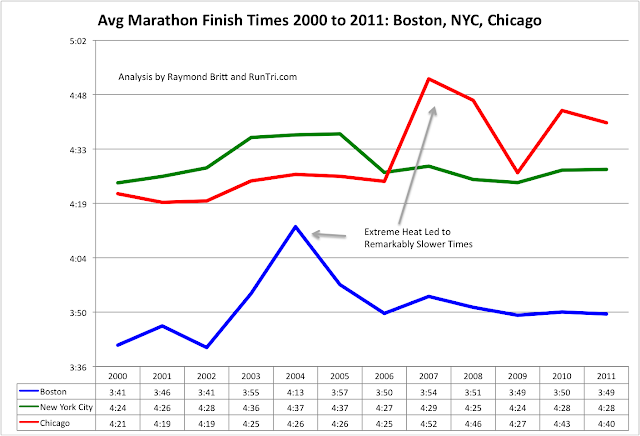 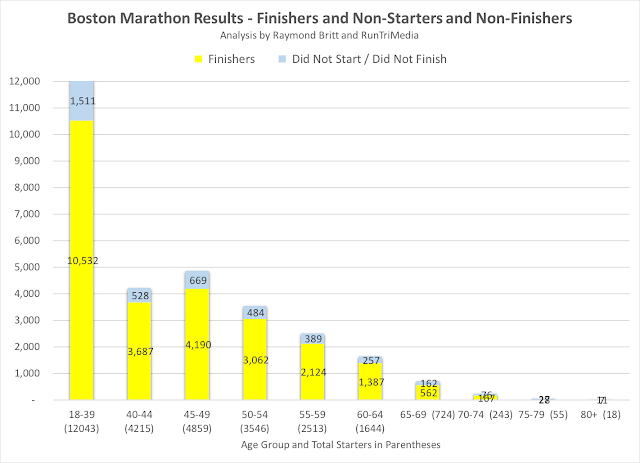 Boston Marathon Results and Finish Times Analysis: How Long Does it Take? 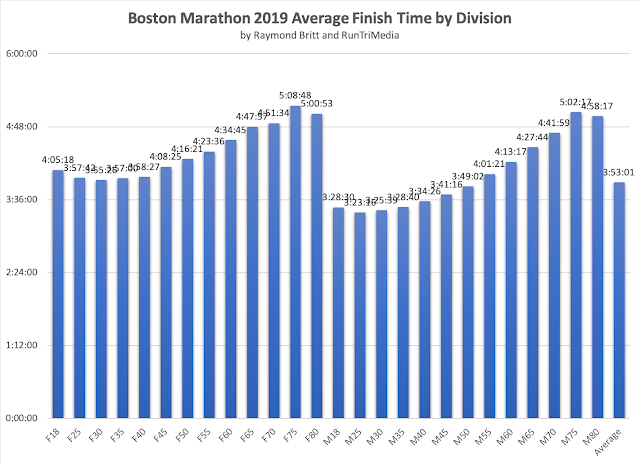 More than 26,600 runners finished the 2019 Boston Marathon in solid overall average time of 3 hours, 53 minutes. 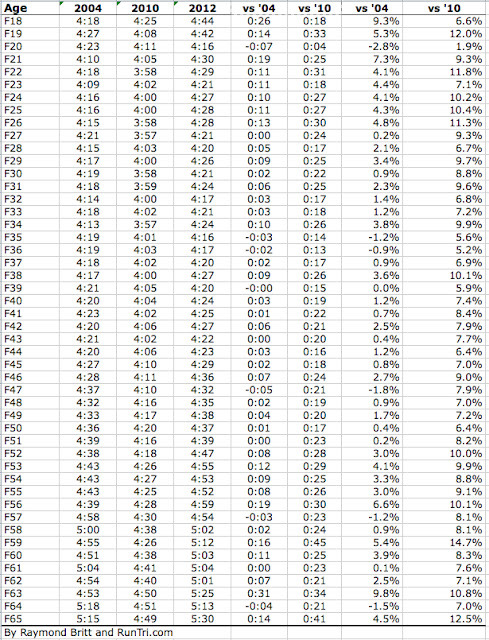 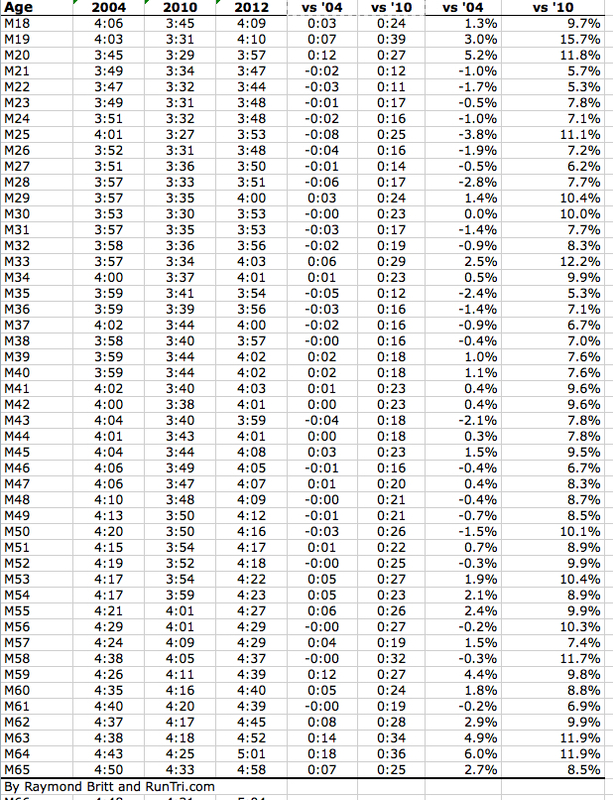 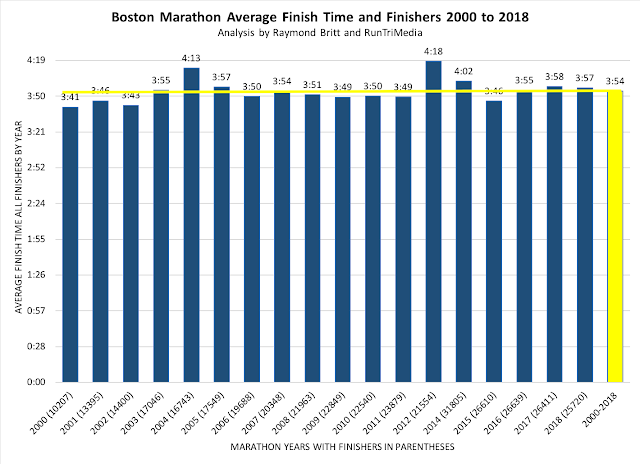 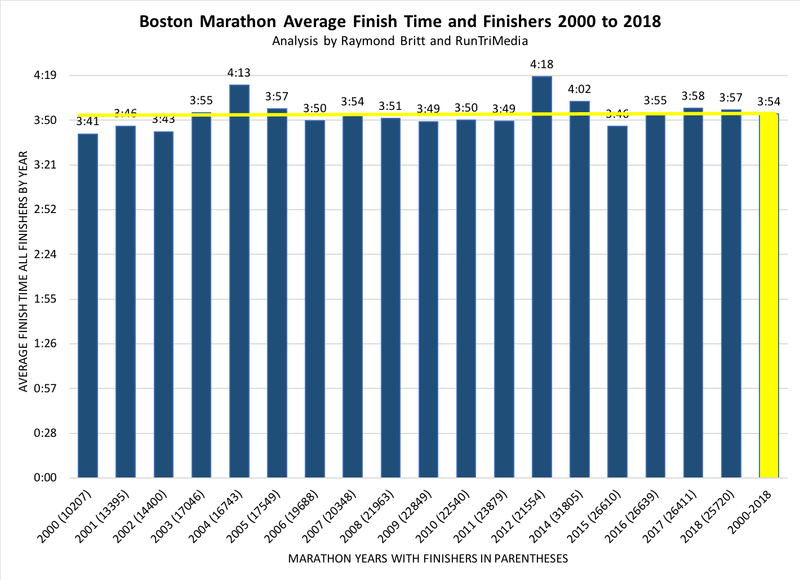 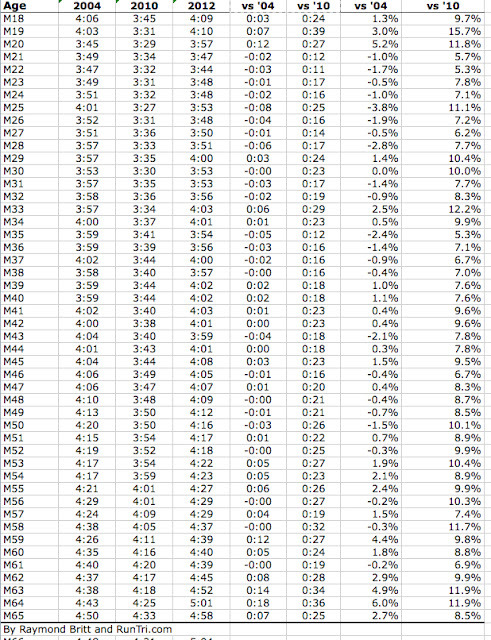 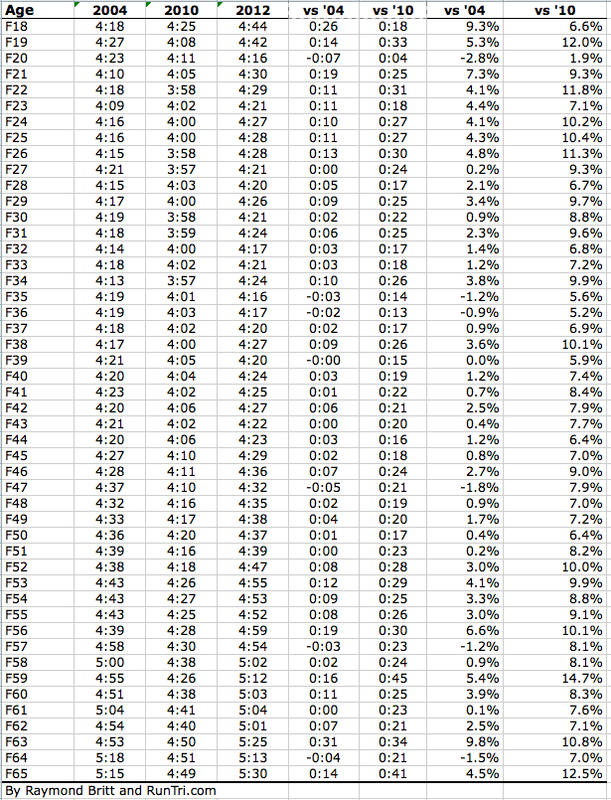 By comparison, the average finish time at Boston 2000 to 2019 is just a minute slower, 3:54. 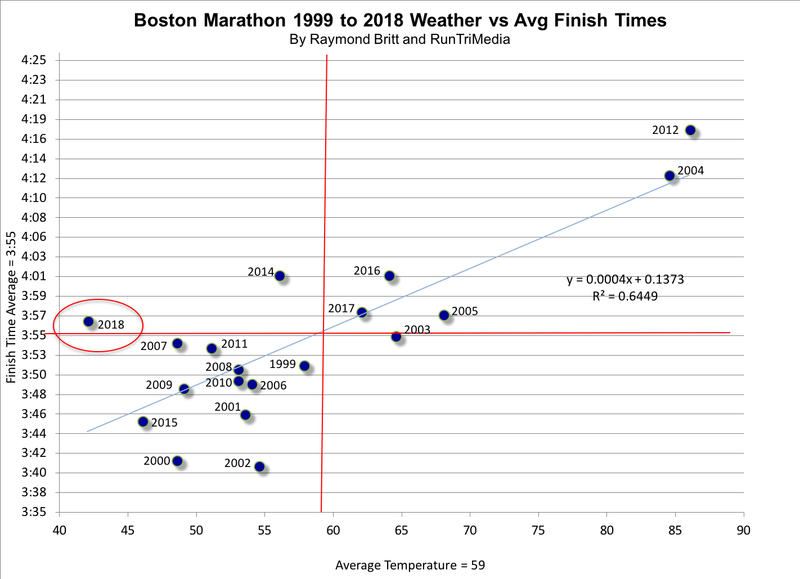 Notably, the 2019 average was 4 minutes faster than the average time of 3:57 in terrible weather conditions in 2018. 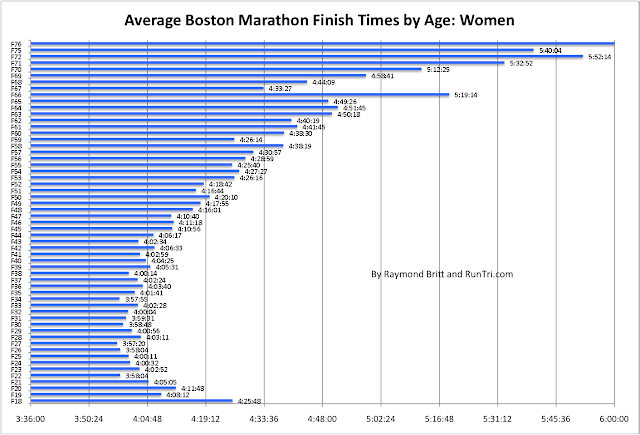 At the next level of detail, here are the average finish times by gender and division. 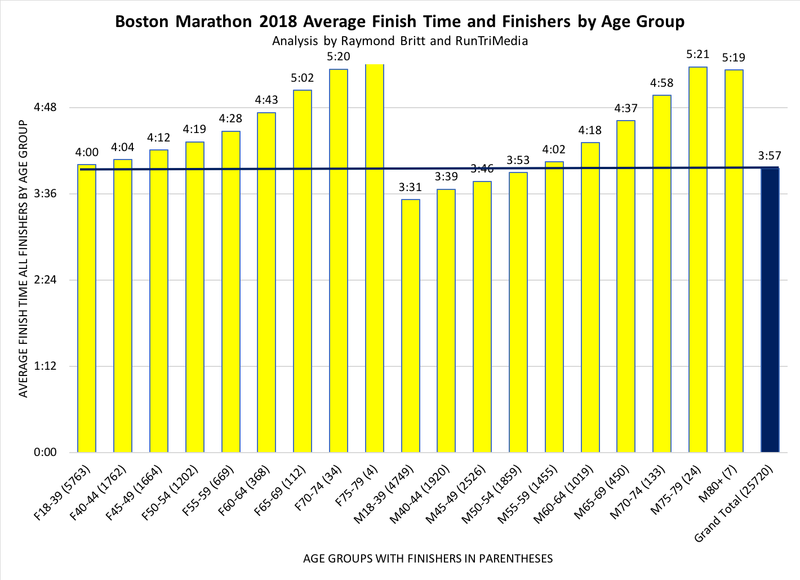 We are currently crunching the numbers to provide comprehensive details comparing age group times over multiple years, and will present the results analysis here shortly. 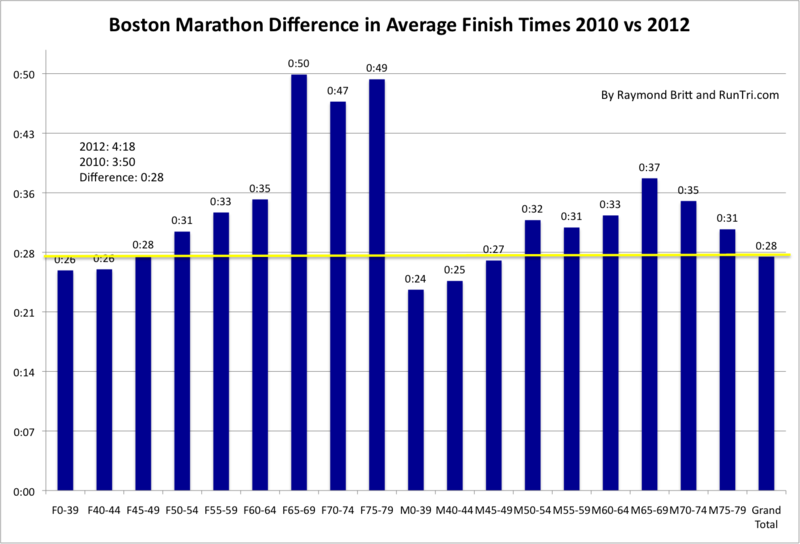 Scroll down to see similar analysis from previous years. 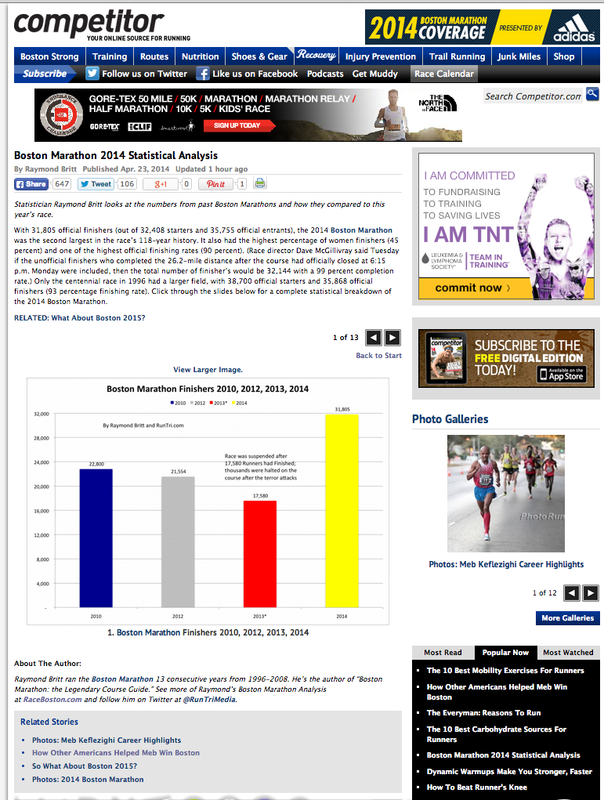 To find individual 2019 race results, visit www.baa.org. 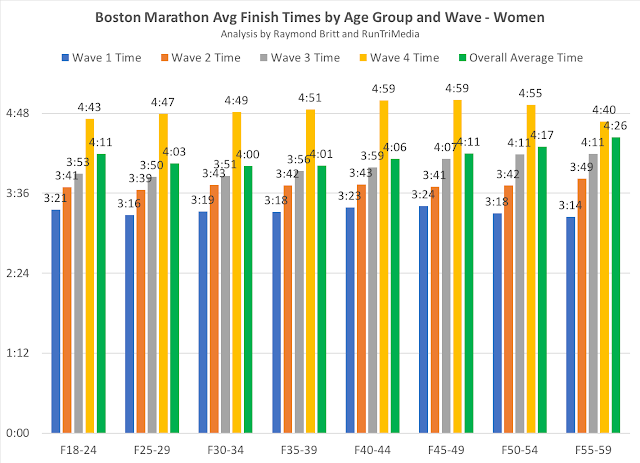 Take a look at our elite race photos, too. 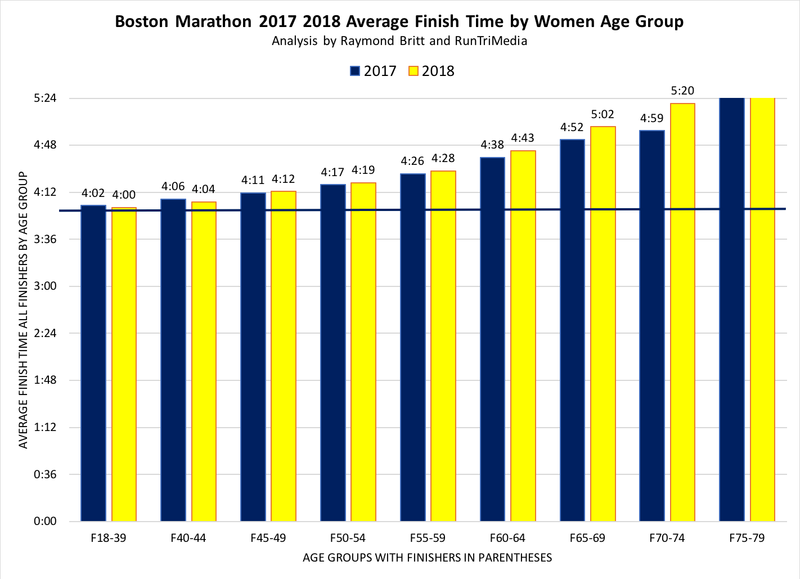 Rough year at the 2018 Boston Marathon as runners had to endure what some are calling the worst weather conditions in three decades: cold, rain, wind, and wind chill. 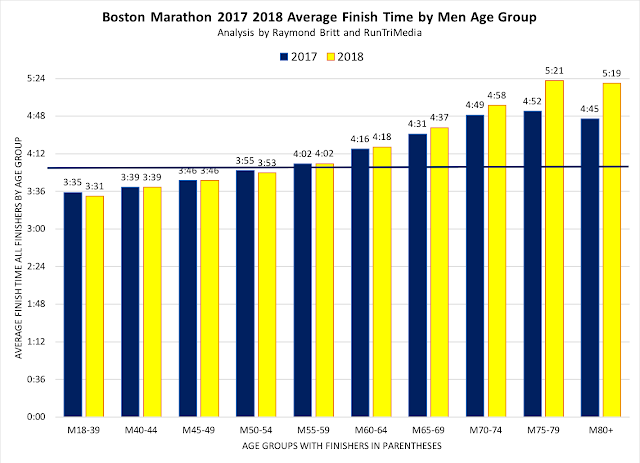 The elites seemed especially punished by the weather, but believe it or not, the average finish time for all in 2018, 3:57, was one minute faster than the 3:58 in 2017. 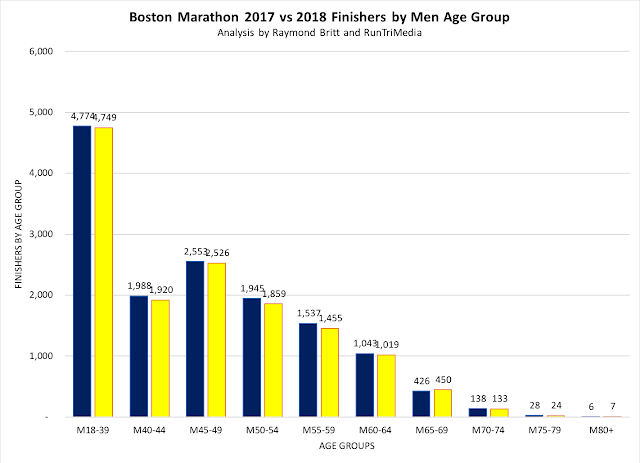 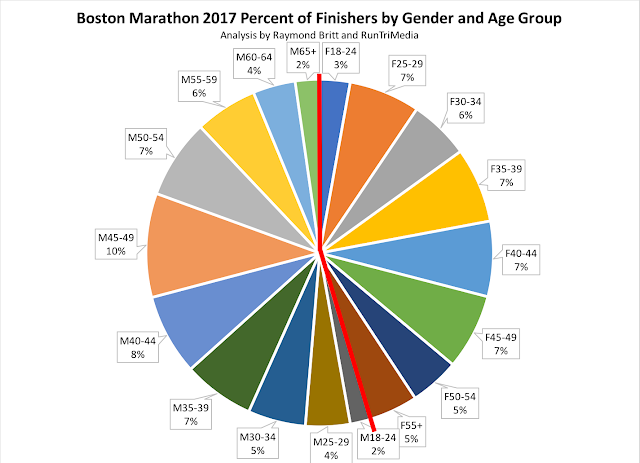 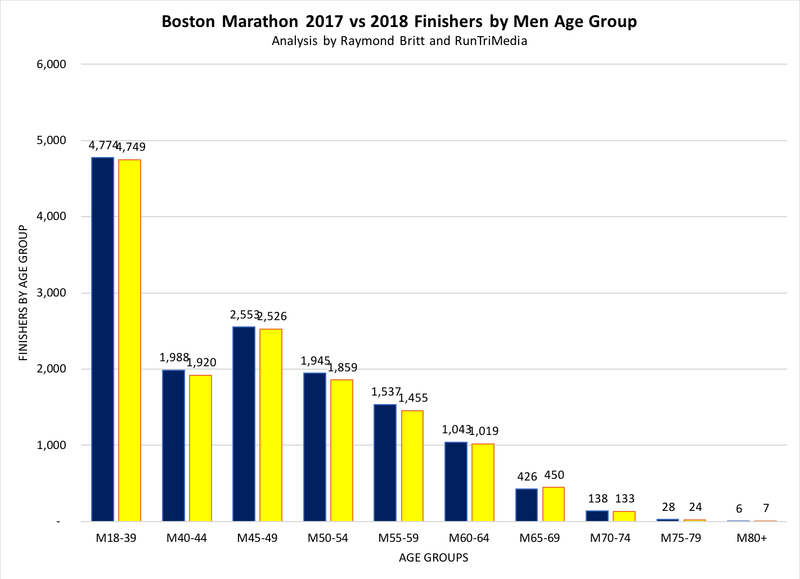 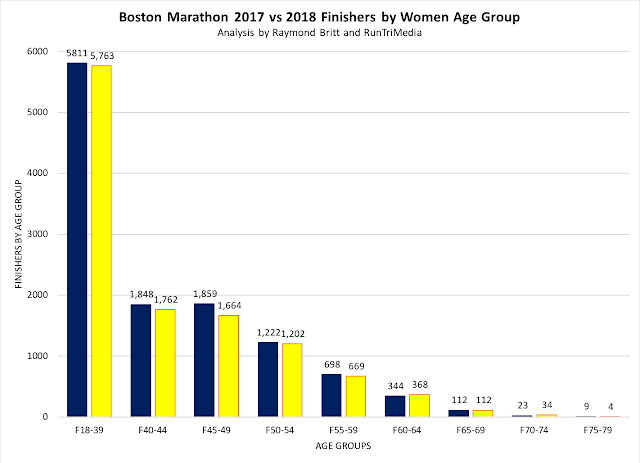 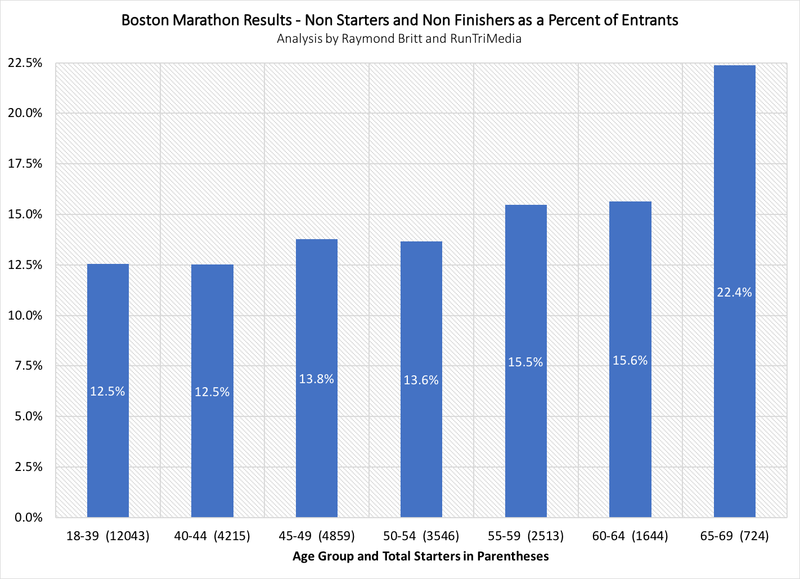 Here we present our annual comprehensive results analysis for all starters, finishers, age groups and the impact of weather on finish times, plus a link to BAA.org's searchable results. 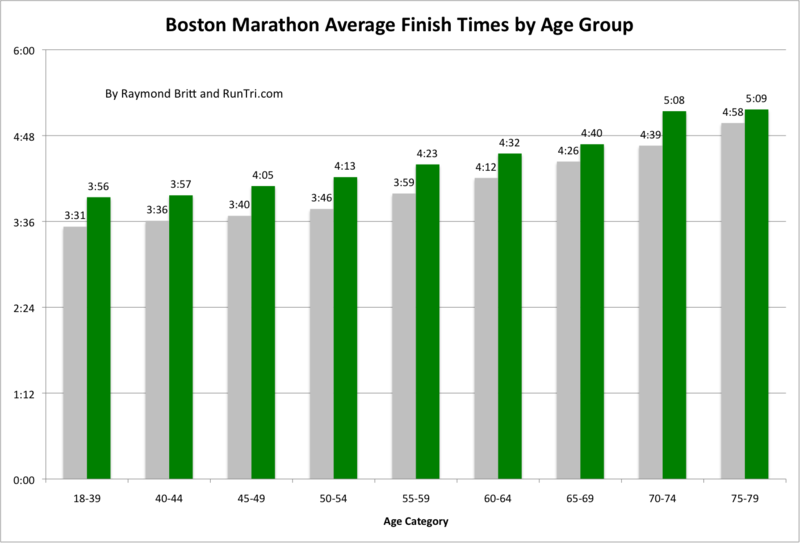 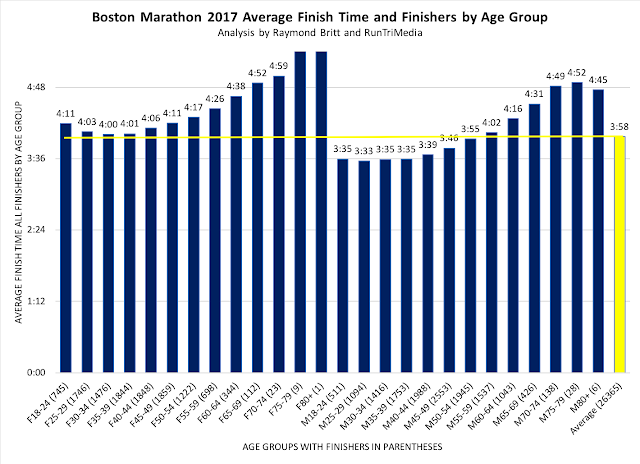 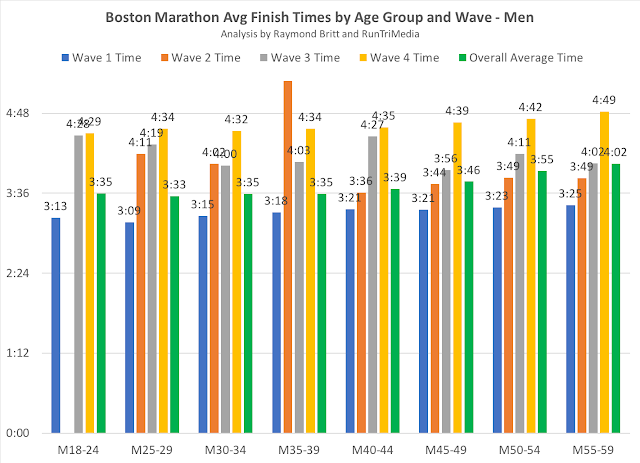 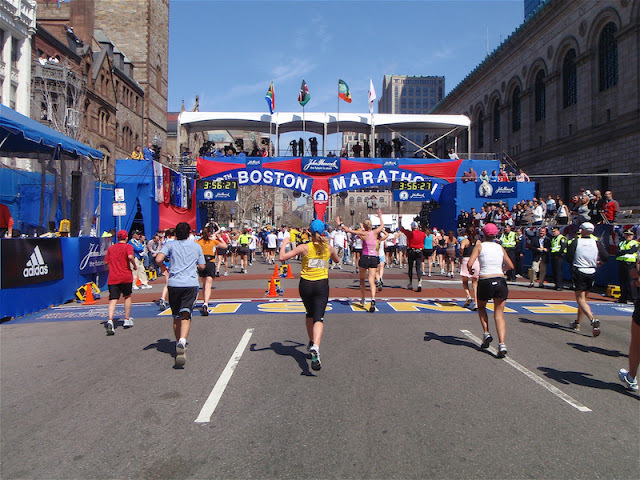 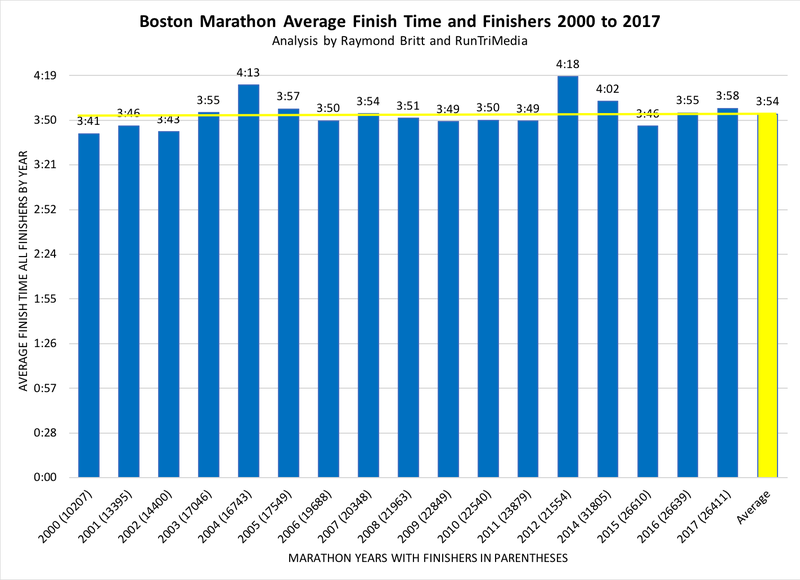 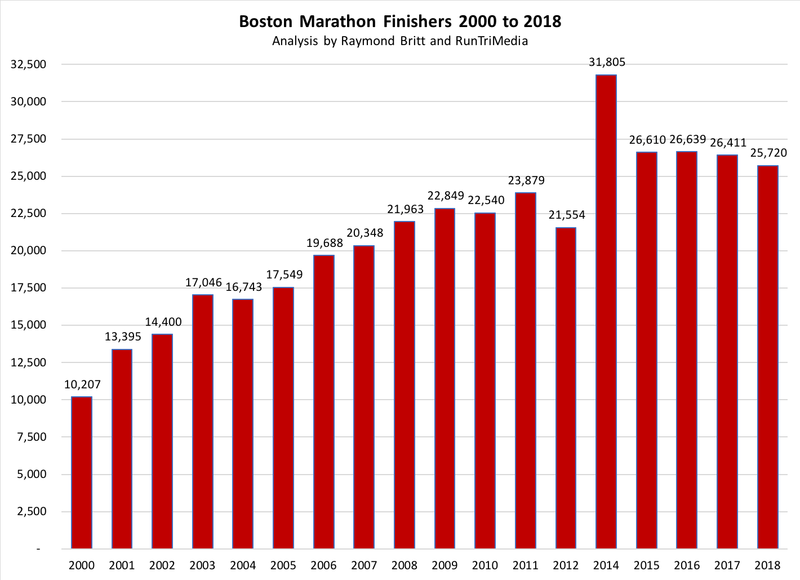 Our analysis of Boston Marathon from the years 1999 to 2018 indicates the average finish time is 3:54; three hours and fifty-four minutes. That's at least 25 to 30 minutes than the average time of the top 25 marathons. 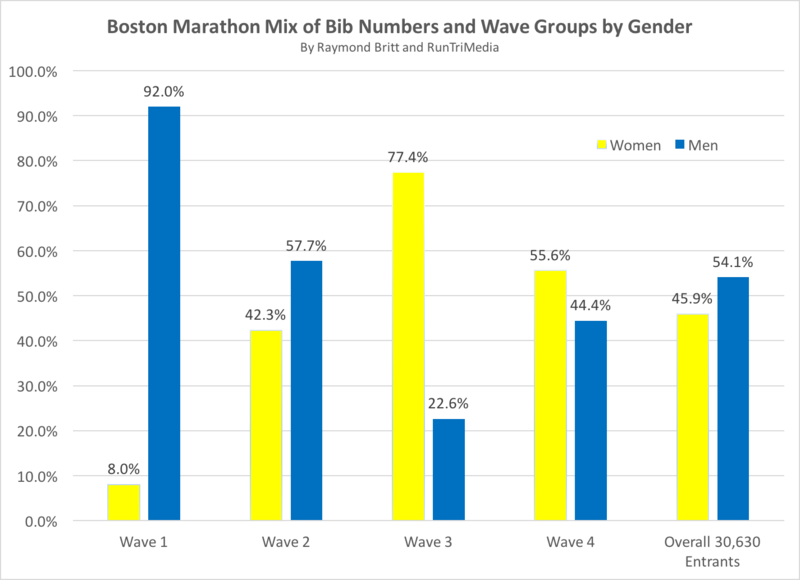 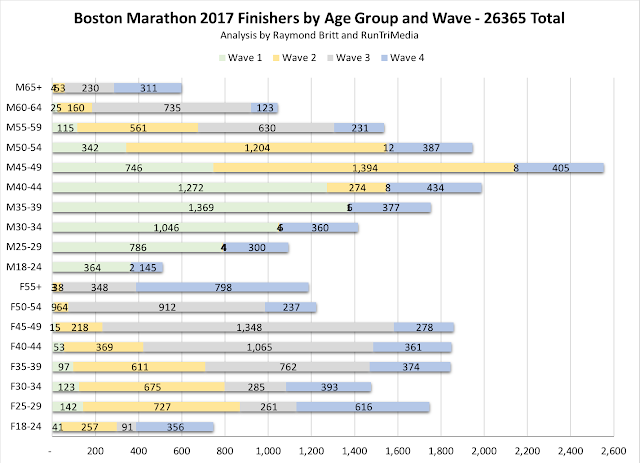 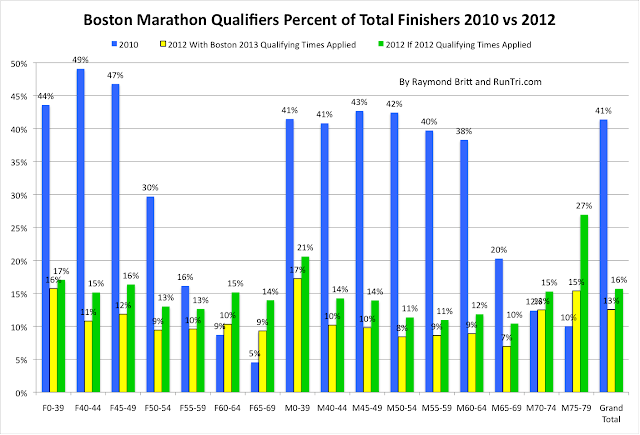 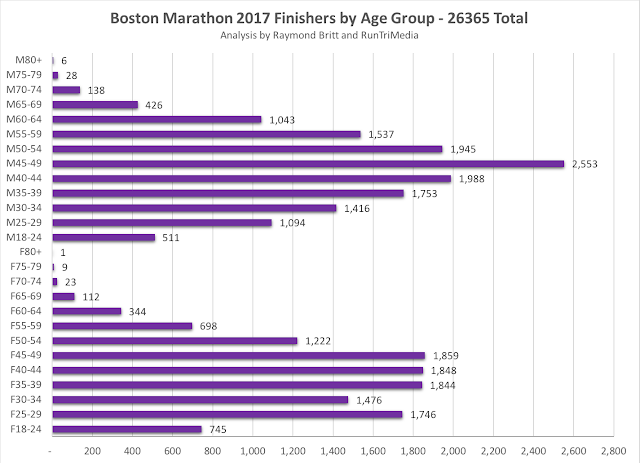 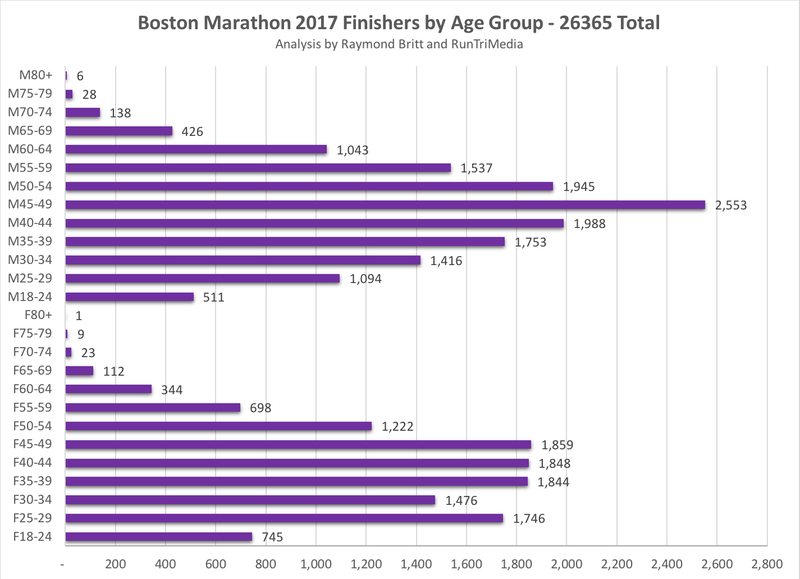 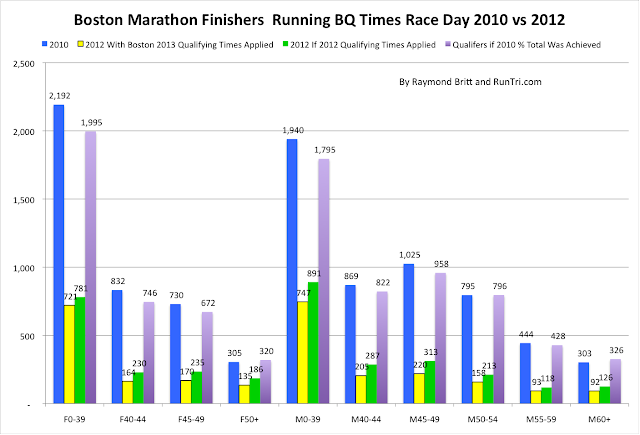 Compare Boston 2012 against both Boston 2004 and Boston 2010 by race division, by gender and age, by city, by Boston Qualifiers, and more. 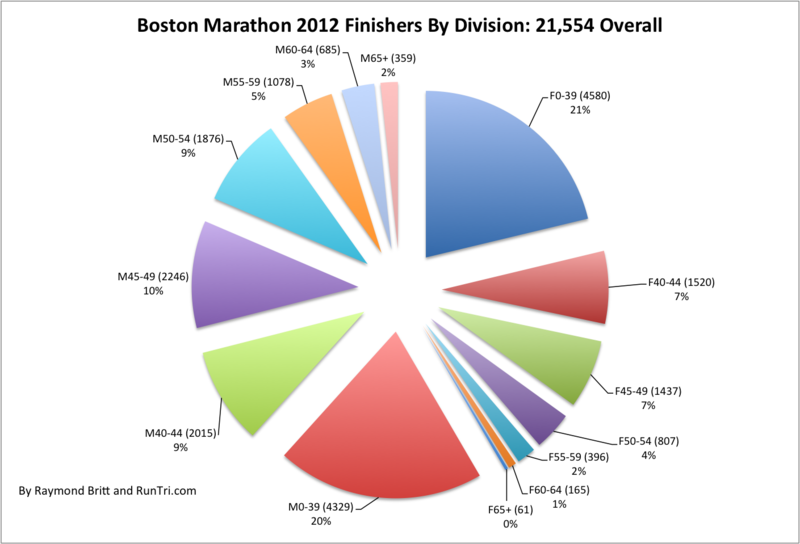 Cities Represented: Finishers from 5,809 global cities finished Boston (see finish times by city and division).